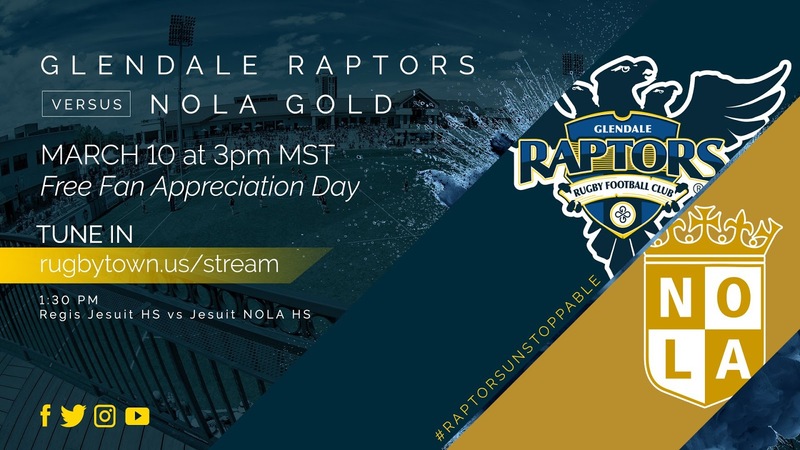 The first streamed MLR vs MLR matchup is between the Glendale Raptors and NOLA Gold Rugby. We've seen pre-season action from the Houston SaberCats and NOLA Gold before, now we get to see the inaugural season presumptive favorite Raptors in their first pre-season action. The game will kick off at 3pm Mountain Time and streamed here. NOLA Gold will be looking to improve from their performance against the Houston SaberCats. They do get Nikola Bursic back from Chile duty in the Americas Rugby Championship. NOLA will have to contend with the altitude, as they are coming from almost below sea level to playing at a mile above sea level. NOLA will also have to compete with the continuity of Glendale. The Raptors mostly played together for almost two years now. They have inserted of few new pieces into their lineup, but it has been mostly the same. The Raptors are the presumptive favorite for a reason. They have been semi-professional and have had the management, academy, and training staff in place for a number of years now. This game will come down to three matchups. The front row, back row, and half backs. NOLA's forward pack will look to get back on track after being dominated by the SaberCats. The Gold's loose trio and half backs will be their key to the game. The forward pack as a whole will likely become a big part of this game as the altitude takes affect on NOLA. Glendale has the ability to match NOLA man for man. Vince Jobo, Matt Houston, and Sebastian Kalm are the power of NOLA's forwards. They will be asked to shoulder a big load for the Gold. For Glendale, Grigor Kerdikoshvili, a goal kicking forward from the Air Force Academy, joins with Connor Cook and John Quill in the back row. This will be a matchup to watch as both back rows can takeover a game at a moment's notice. Kelepi Fifita will plug in at tighthead to form a front row with Luke White and Zach Fenoglio. They will compete against the Canada duo of Hubert Buydens and Eric Howard, as well as former teammate Ben Tarr. Perhaps the best matchup of the day will be between the half backs. 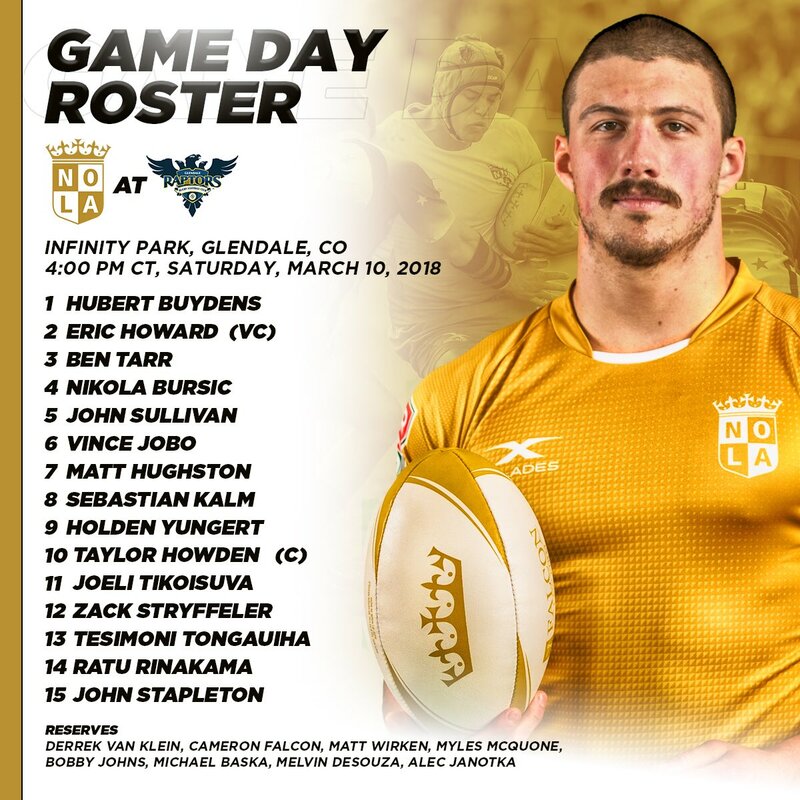 The USA Eagles duo for Glendale vs a potential Eagles duo for NOLA.Shaun Davies and Will Magie will be an integral part of Glendale's game plan. Holden Yungert and Taylor Howden will look to counter with their own game plan. With Glendale only having an announced roster of 25, they have brought some players up from their U23 side. 19 year old, six-foot, seven inch, 230 pound lock Maxwell Dacey will provide some height for the Raptors. Outside of Casey Rock and Ben Landry, the Raptors have no one above six-four. They have also brought in Mikaele Kruse as fly half back up. Look for Glendale to have a fast, physical, and open style of play. They will look to run NOLA off the pitch. NOLA will likely try to slow the game down as they look to combat the altitude. Let's hope this match is another example of what can be expected during the MLR regular season.